A THRIVING CULTURAL sector is an essential part of what makes a city great, along with green spaces and immigrants who bring renewal and vigor to city life, according to a recent study by McKinsey, a consultancy. 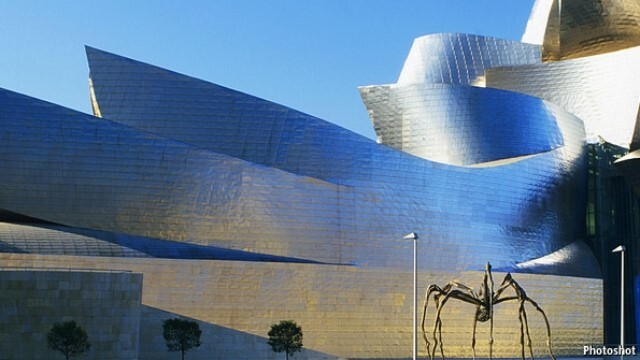 The opening of the Guggenheim Museum in Bilbao in northern Spain (pictured) in 1997, 20 years after the Pompidou Centre, shows how an imaginatively designed museum commissioned by an energetic mayor can help turn a city around. Visitors’ spending in Bilbao in the first three years after the museum opened raised over €100m ($110m) in taxes for the regional government, enough to recoup the construction costs and leave something over. Last year more than 1m people visited the museum, at least half of them from abroad. This was the third-highest number ever, so the building continues to attract visitors even though the collection on display is modest. Other cities without historic cultural centre’s now look to Bilbao as a model for what vision and imagination can achieve. Over the next decade more than two dozen new cultural centre’s focused on museums are due to be built in various countries, at an estimated cost of $250 billion, according to a study by AEA Consulting, a New York firm that specialises in cultural projects.. Such cultural hubs need a clear vision of what they can offer if visitors are to come more than once. The new centre in Perth, an expanded version of the existing Western Australian Museum, is relaunching itself as the museum of the Indian Ocean and is already planning exhibitions in collaboration with museums in Mumbai, Muscat, Abu Dhabi and Nairobi.